Methodist Historical Society of Ireland - Their Family History and Genealogy page gives some useful information on the history of the movement in Ireland. Explore the various tabs to find out more about what is available in their library in Belfast and some limited material and finding aids on line. Unfortunately, it does not look as if the on line material has been updated in some time but there is an email address to make contact if you have a specific question - the archivist is very helpful. This picture is of a lovely little Wesleyan Methodist chapel in Clonegal, Co. Carlow which was built in 1854 and was where my great great grandfather, John Perrin Hopkins married his 1st cousin, Sarah Hopkins in the same year - I wonder if the plaster was dry! It's now a private home called "Wesleyan Lodge" but there are still several graves with headstones for members of the Webster family in the tiny little publicly accessible graveyard attached. ​I found The Methodist Class Book - Newtownbarry Circuit 1819-1846 online (unfortunately the link has since become broken and I haven't been able to find it again.) Very specific I know, but this turned out to be a great resource for doing some family reconstruction on a single surname (Hopkins) in this corner of Ireland where Counties Wexford, Wicklow and Carlow meet. Basically, if your name wasn't Hopkins, I'm not sure they let you in! 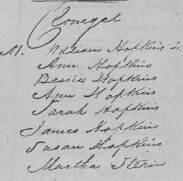 If you have ancestors who were Methodists elsewhere, try using some combination of the terms "Methodist", "Class Book" and "Circuit" in a search engine to see what might crop up elsewhere.